The H2n's onboard 90° X/Y stereo condenser mics are arranged with the right and left mics on the same axis. This design ensures that the mics are always equidistant from the sound source for perfect localization and no phase shifting. The result is brilliant stereo recording with natural depth and accurate imaging. 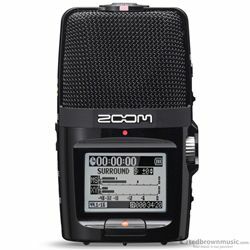 Five new mic capsules provide four unique recording modes: The H2n features our best microphones yet and is the only portable recorder with five mic capsules onboard. This design enables the H2n to offer four unique recording modes: Mid-Side (MS) stereo, 90° X/Y stereo, 2-channel and 4-channel surround sound. Create stunning 360° surround sound recordings: Using the H2n's Mid-Side and X/Y mics together, you can create stunning 360° surround sound recordings. Choose between 2-channel mode, which combines the Mid-Side and X/Y mics, and 4-channel mode, which records two separate stereo files, allowing you even more post-production capability. No matter which mode you use, you’ll get perfectly balanced, surround sound recordings. Linear PCM recording at up to 24bit/96kHz quality: The H2n supports linear PCM WAV recording at 24bit/96kHz, which far exceeds standard CD-quality. Use a high-resolution WAV format to faithfully capture the delicate reverberations of natural sounds and acoustic instruments. For web and e-mail distribution, choose one of a dozen convenient MP3 formats. Broadcast Wave Format support: The H2n supports the Broadcast Wave Format (BWF) used for broadcasting and other professional applications. With this format, each file can have a creation date/time stamp and up to 99 track marks (cue points) to help with file management and finding desired points in recordings. Newly designed user interface: The H2n is remarkably easy to use. With its newly designed user interface, critical controls are right at your fingertips and make studio-quality recording a breeze. The H2n also houses an arsenal of comprehensive functions, including Auto-Gain, a compressor/ limiter, Low-cut filter and more. Special playback features aid practice: Various playback functions make the H2n ideal for music-and even language-practice. Use the Variable Speed Playback to adjust the playback speed between 50% and 150% of the original, the Key Control to adjust the pitch, and the AB Repeat function to loop a desired part. You can even use the H2n as a music player, as it supports playback of a single track or all tracks in a folder once or repeatedly. The tuner and metronome are also handy when practicing with an instrument. Edit audio onboard: You can edit audio right on the H2n. Without connecting to a computer, you can Divide recorded files and Normalize them to maximize their volume. You can also use the MP3 encoder to convert WAV files to MP3 files. Data recovery function protects against unexpected errors: Never again will you have to worry about losing recorded data to unexpected errors. The H2n has you covered with its new data recovery function. Whether you experience battery loss or an accidental power-down, this feature will automatically restore your data the next time the H2n is powered on. 20 hours of battery life: The H2n provides over 20 hours of continuous operation on just two standard AA alkaline batteries! This astonishing feature enhances the H2n's flexibility and convenience. In addition, the H2n can also operate using an AC adapter, which is included in the optional APH-2n Accessory Pack. Analog Mic Gain for precision volume control: Digital volume controls offer too much or too little gain, with no middle ground. The H2n's analog Mic Gain wheel allows you to dial-in the perfect amount of gain for any given application. Onboard reference speaker and stereo output: The H2n's built-in reference speaker lets you know your recordings have been captured. With its 1/8-inch stereo output, you can also playback your recordings on your home audio system or listen to your masterpiece using your favorite pair of headphones. 32GB SDHC card support: The H2n uses SD/SDHC cards and can accommodate up to a 32GB SDHC card for over 50 hours of recording time using the 16-bit/44.1kHz WAV format. With 128kbps MP3 format, you get an incredible 555 hours of stereo recording. The H2n comes with a 2GB SD card to get you started. LCD screen is bigger and brighter: The H2n's 1.8-inch backlit LCD display (128 x 64 resolution) provides crystal-clear monitoring and makes it simple to navigate all of the unit's functions. USB 2.0 Hi-Speed allows for rapid file transfer: Use the H2n's High-Speed USB 2.0 interface to transfer files to your Mac or PC. Once your recordings are on your computer, you can easily store, edit, playback and share your favorite creations. You can even use the H2n as a USB microphone, letting you record directly to your computer. WaveLab LE software included for editing and mastering: Steinberg's WaveLab LE can be used for audio editing and professional-quality mastering. By using its precise waveform editing and high-quality processing, you can refine your recordings into finished works. Furthermore, you can freely download the "MS Decoder", a plug-in for mid-side decoding. Use this to convert mid and side signal data into left and right signals. Using the Mid and Side faders, you can adjust the stereo image as you like.